As much as I find the evil eye concept interesting, I also largely find the high street manifestations really ugly. Sorry Topshop but I don't want to sport a ring with what is effectively a life-size eyeball on it. For a long time then I have looked for an *affordable* and yet pretty version of the evil eye. There are many versions with 4 figure price tags and real diamonds but I will quite happily take the glass/crystal version thank you very much! It was whilst looking through the stalls at Covent Garden Market in Dubai that I came across this beauty...it was EXACTLY what I have been looking for. A metal (although who knows what metal exactly!) chain and a dainty evil eye that embodies the design without looking ugly. 3 months later and I have worn it every single day. Even if it's not silver plated, it has accompanied me in the sea, through 3 months worth of showers and 100's of OCD hand washes. It's held up beautifully. Now this is the tricky bit. The only site where I have found this charges about $50 for an identical bracelet. Do not pay $50. There are many others on eBay (here's another one Link! ) and the best priced ones seem to originate from Turkey - so keep that in your search criteria. ooooo i love this version of it, its so pretty - totally agree that the eyeball white/blue plastic-y ones just look weird. Haha, I so know what you mean about the high-street versions like the rings. Just plain scary!! This one is pretty though, simple and dainty, it'd look good stacked with a couple more bracelets too. ooh my goodness i have this same exact bracelet and i love it! i have since wanted to buy it for friends and can't find it anywhere!! i get compliments on it all the time- i think it was like $15 at a mall! michele1218 has it and it looks really cool on, she also has one that looks exactly like your bracelet but in necklace form! i think hers is from greece or turkey! I have a very similar bracelet and I love it! I am now on the hunt for a very dainty necklace form. I got my bracelet off etsy, you can find very reasonable prices on there too! ummm, I'm back again! I just read up on pretty much the whole thing (very bored at work, haha) after clicking one of your links! I went to school with loads of girls who were always wearing these eyes set into the palm of hands on jewellery. I think that's what protects you from the evil eye, so I suppose when it's just the eye alone you're actually just wearing the evil eye. I see loads of the eye things, all alone though, I wonder if people realise...guessing most people aren't wearing it to really protect themselves though, more just for fashion. I like the concept though, I actually prefer your style that's not on the palm of a hand too! thats the best evil eye i've ever seen! love it! I'm loving this "evil eye" trend, thanks Laura for the ebay links! I searched and searched for a similar bracelet/ pendant whilst on holiday. Thanks for the links I will give ebay a whirl! I want! Love your blog, I'm following now :) Feel free to check out mine! I've been looking for one of these looked on Ebay etc. none have caught my eye! ..but yours is lovely!! i'm going to keep looking hopefully spot a gem like this. I absolutely adore this! it's so darling and dainty and it's beautiful! I want one now! lol I've always been quite interested in the evil eye concept and love little folksy things like dream catchers and things to ward off evil spirits, and I hate how commercialised and expensive they've become. I found a gorgeous hamsa necklace at Global Village last year for 30 dirhams! It was the same kind of metal, it hasn't faded yet. I love browsing Covent Garden, but some of those stalls are just sooo over priced! After searching online i realized your bracelet is a bit different then others. It seems your 'evil eye' is eye shaped and all the others are perfectly round. Maybe it's lens distortion or is it really eye shaped? Yours is truly beautiful. That is the pretties evil eye bracelet I've seen! I have one that's not nearly as pretty but I haven't worn it in so long! I think working at a jewellery store for years in my teens has ruined me. I always fear spending any money (no matter how insignificant) on base metal jewellery! I also think people's body chemistry makes such pieces tarnish at different rates, so with my constant purell-ing and laura-like handwashing, i'd undoubtedly have a green bracelet (and matching wrist) within a week. I think i'll show my ex-boss jeweler a picture to make a similar one in a sterling silver or white gold. in 10k/14k, such a dainty piece would still be under $100. and that way, it can be welded if it snaps and i can wear it with a little more bravery than a metal one. Perhaps you could spare 5 mins to glance at my blog? I am new to the whole thing, and any tips would be greatly appreciated! it is beautiful...i'm craving a dainty little bracelet. Tai makes a beautiful evil eye braclet. I got mine from my local Neiman Marcus ( got many evil eye everything from Turkey/UAE. Definitely agree some of the ones out there are really big and gaudy so I love how dainty your is. I also like how it's not explicitly "HI I'M AN EYEBALL". What a great find, Laura! Lebanon is evil-eye jewellery heaven! Last time I was there I stocked up on these dainty bracelets. They're reasonably priced, too. Oh I had A Greek boyfriend who had them everywhere, even above the bed - yeah there's probably a dodgy movie out in Greece now. Adorable! I got an Evil Eye bracelet from the Theresa Mink Etsy shop, it's gorge, I really enjoy wearing it! I got a necklace similar to your bracelet when I was in Turkey. That was 11 years ago though and the clasp broke on it so I now have a loose evil eye and a useless gold chain. I wish I asked my brother to get me a new one when he went back to Turkey since my broken one taunts me with it's unwearable prettiness. I always have one on me or in my wallet at all times for good luck. I remember being told if your evil eye breaks or falls off.. it protected you from a particularly horrible dose of 'evil eye'/jealousy/bad energy!! It's really pretty Laura. Thanks for sharing. i have always been interested in owning something with the evil eye also, this one's so classy and cute! Oh I love that, it's so delicate and pretty! This is gorgeous! But be careful because it's bad luck to buy an evil eye charm for yourself!! Thats so pretty, so much better than the topshop ones! WOW that is the cuttest thing! I have been rally into bracelets lately! I want this! I love this bracelet! Simple but still very cute! I like your version a lot, it gives it the real eye look. And I like how dainty it is! I have one very similar in rose gold and have become very superstitious about wearing it now hehe. Dana Levy also does some really funky evil eye bracelets. I love love love love that bracelet! Surprisingly, River Island actually have a very similar one for about £5. absolutely fab piece, so understated, love it, must scout one out for myself now!! I love your blog soo much, I've been inspired by you for a long time back to the early youtube days!! I love your style of writing light and interesting, thanks for being wonderful!!! It's beautiful! I'm also not too crazy how the evil eye looks but the one you have is so nice and delicate. I wish they had it with different birthstones. This is so pretty and dainty! I have a love/hate relationship with evil eyes, if they're not done well, they end up looking like ugly eyeballs like you said, fitting only for Halloween or sth! This is such a lovely piece though!!! Great buy!!! OMG. it's delicate and beautiful *_* Please visit my blog, and follow if you want to. Very much a fan, one of the most beautiful, feminine and indeed dainty evil eye pieces I've ever seen! I love it! Agree with you about horrible, ugly high street versions, big old eyeballs are so creepy! i like that it's so delicate! It's beautiful, i find the concept very fascinating too, i'm going to be on the look out for a nice one! finally someone who thinks eye balls as jewellery is wrong! BTW have you tried essie 'lady like'. I got it today and it's gawjuss. I think you will love it! I've been looking for a cute dainty evil eye necklace and am still on the lookout. this bracelet looks really nice ! Super cute bracelet! Is it sad that it reminds me of the Real Housewives of Orange County? Yes..yes it is...lol. I have got a small pin inside my wallet to keep away the evil thoughts of people but hadn't thought of it as an accessory. You have really nice posts on this blog i like this cheap wristbands thank you for sharing it!! I love your bracelet. It is so delicate and graceful ! Spores do not fill the cushion. Enable the mattress Homefrik - To find unexpected best products for your home. bed bugs are entirely gone. Bed insects. Spy applications, consisting of mSpy, FlexiSPY, Mobile Spy, Quick mSpy Login You'll have the ability to keep an eye on the phone's task. Great post. 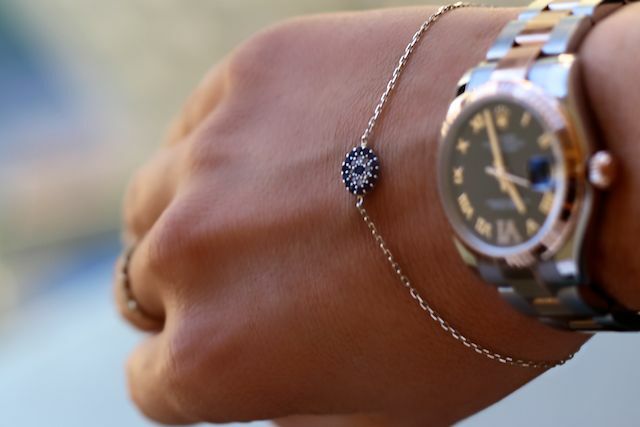 How to protect yourself from the evil eye with an evil eye bracelet? It's believed that there are three types of evil eyes. The first is unconscious evil eyes. These harm people and things, without intending to. The second type intends to harm. The third one is unseen, the hidden evil which is the most scared one.